Heading to work? Going on a business trip or on vacation? MiWay’s Route 100 – Airport Express is now operating every 16 minutes, Monday to Friday, along the city’s dedicated bus-only Mississauga Transitway. MiWay riders can travel between 4 a.m. and 7 p.m. from Winston Churchill Station to Renforth Station and express to Toronto Pearson International Airport Terminals 1 and 3. Route 100 stops at all 12 transitway stations and offers connections to the Toronto Transit Commission (TTC), GO Transit bus service and Brampton Transit. To celebrate the new Route 100 – Airport Express, which started service on October 29, Mayor Bonnie Crombie and Members of Council were joined by the Honourable Navdeep Bains, Minister of Innovation, Science and Economic Development on behalf of François-Philippe Champagne, Minister of Infrastructure and Communities; Howard Eng, President and Chief Executive Officer (CEO) of the Greater Toronto Airports Authority; Adrian Kupesic, Director, Public and Government Affairs on behalf of Alok Kanti, President and CEO, Bayer Inc; and Tullio Capulli, Vice President, Property Management and Leasing Office & Industrial, Eastern Canada, Morguard Brokerage. Route 100 is part of the MiWay Five Transit Service Plan from 2016-2020. 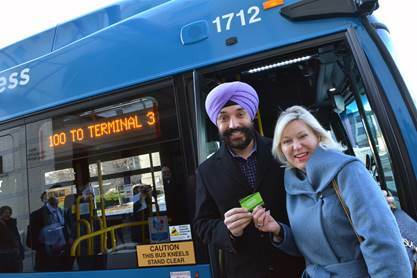 The plan is moving Mississauga’s transit system to a grid network allowing more frequent buses along main corridors, improving connectivity to surrounding municipalities and making travel to Toronto Pearson International Airport easier. Route 100 will serve customers in Mississauga’s downtown core and in the Mississauga Airport Corporate Centre. These stops target Mississauga businesses, offering them an efficient way to travel to the airport. Plan your MiWay trip on Route 100 – Airport Express by visiting miway.ca/planatrip or by calling 905-615-INFO(4636) for customized route and schedule information. MiWay is Mississauga’s transit service and the third largest municipal transit service in Ontario. MiWay services a high-growth population of more than 752,000, travelling across 179 kilometres. MiWay’s bus fleet of nearly 500 vehicles is fully accessible. MiWay provided more than 55 million annual boardings in 2017 across more than 80 bus routes. MiWay service connects with neighbouring transit systems including GO Transit, TTC, Brampton Transit and Oakville Transit. As of November 22, MiWay customers will be able to travel along the full 18-kilometre Mississauga Transitway from Winston Churchill in the west to Renforth Station – the final station in the east. MiWay will service 12 stations along the dedicated bus corridor from west-east: Winston Churchill, Erin Mills, City Centre Transit Terminal, Central Parkway, Cawthra, Tomken, Dixie, Tahoe, Etobicoke Creek, Spectrum, Orbitor and the new Renforth Station. These service improvements expand Mississauga Transitway service on the Renforth Station platform as well as on-street bus bays along Commerce Boulevard and Skymark Avenue. For a complete list of service changes, please visit miway.ca/miway5. Today, General Committee directed staff to continue the MiWay Discount Transit Ticket Program with Mississauga food banks permanently. Initially, the pilot program began in November 2016 with six food banks. In May, it was expanded to include all 18 of Mississauga’s food banks and is currently set to conclude on December 31, 2017. To date, four of the 18 designated Mississauga food bank locations have purchased discounted MiWay tickets with the City’s portion of the pilot program costing $7,500. For 2018, the projected cost of the program is $20,000. The continuation of the program will receive final approval during the November 22 meeting of Council. For more information, call MiWay’s Customer Service at 905-615-3636 (INFO). Today at General Committee, MiWay’s proposed Affordable Transportation Pilot Program (ATPP) was approved in principle by Mississauga City Council and is on its way to becoming a permanent program in January 2018 along with the Senior One Dollar Cash Fare at off peak-times. Final approval is to follow at the October 11 Council meeting. Canadian Forces veterans and a friend may ride for free with MiWay on Saturday, August 19 to attend the 96th Warriors’ Day Parade. “MiWay is once again proud to support the Warriors’ Day Parade and all veterans or serving members of Canadian Armed Forces for the sacrifices they have made for our country,” said Geoff Marinoff, Director, Transit. To receive a free ride on MiWay, veterans must identify themselves to a transit operator by wearing their uniform or displaying a medal or any other item that distinguishes them as a veteran. The Warriors’ Day Parade is a tradition that originated in 1921. It occurs annually at the Canadian National Exhibition (CNE) in Toronto. This year’s event commemorates the 100th anniversary of the Battle of Vimy Ridge (1917-2017) and the 75th anniversary of the Dieppe Raid. Plan your MiWay trip by visiting miway.ca/planatrip or by calling 905-615-INFO (4636) for customized route and schedule information.